Elegant and trendy for any situation. These really can be worn with anything - evening wear, beach wear, clubbing, formal / office wear, etc. The detailing is exquisite, with a silver rim around the footbed and interwoven diagonal line design to the upper. 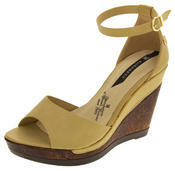 Dolcis have exceled in the design and quality of these wedges, providing why they have such a large and loyal fan base. The Dolcis brand continues to serve up stylish, cool and contemporary designs to appeal to style minded young women. Fashion forward, catwalk inspired styles are adopted each season, all incorporating trend relevant prints and intricate finishing touches to appeal to the avid follower of fashion.